There can be a bit of confusion of all the various items one should wear when dressing as a 1860’s lady, and in what order all of these items belong. I have created a picture tutorial of what I humbly think (based on research and practicality) the order of events should be when dressing. Hope this helps! Put on stockings and garters. Put on chemise and corset. Lace up corset as tight as you can but make sure you still feel comfortable and can breathe normally. Do your hair. I find that this is the best point to create one’s hairstyle. This way you have the basic foundation of clothing on, yet you can still move fairly easily. Put on your pantaloons and tuck your chemise in. 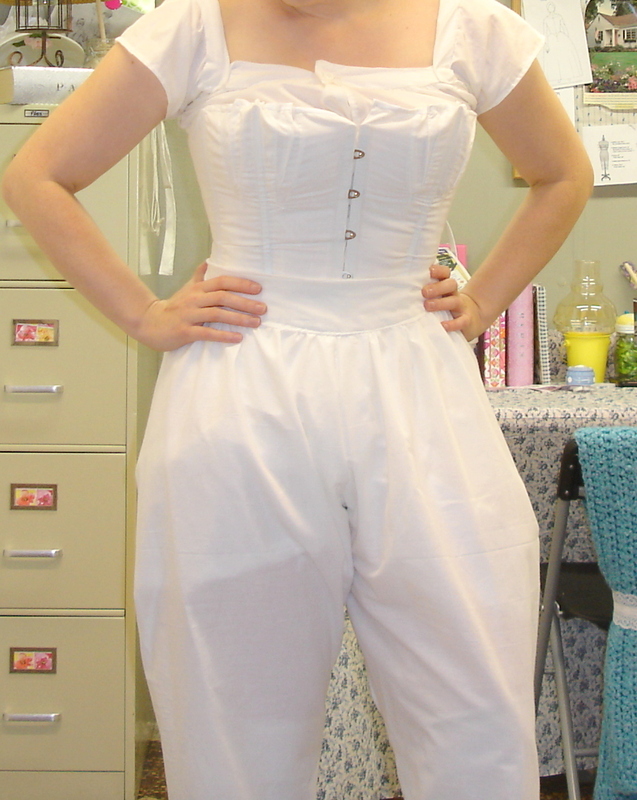 Some people but their pantaloons on underneath the corset…it is your choice. 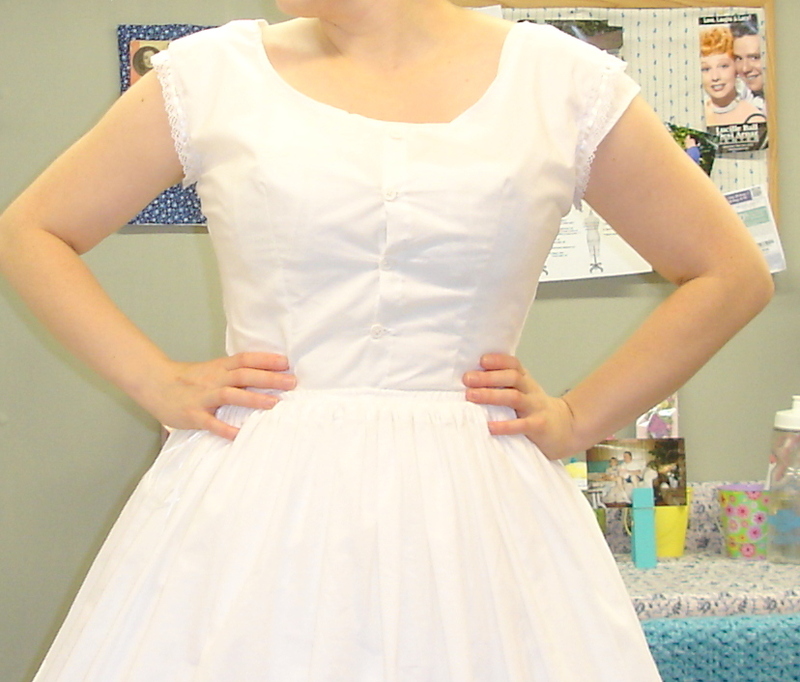 Put on a modesty petticoat. 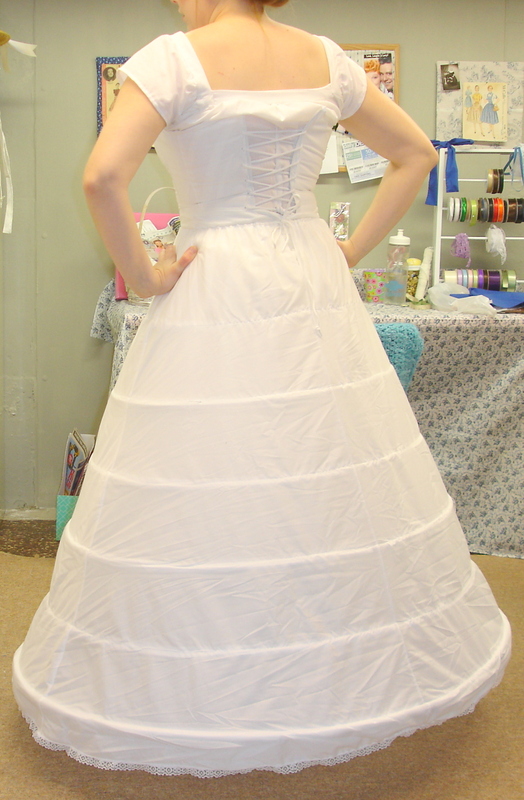 The modesty petticoat is not as long or as full as a regular petticoat and is designed to protect you should your hoopskirt go flying about! I find this piece to be rather annoying but needed. 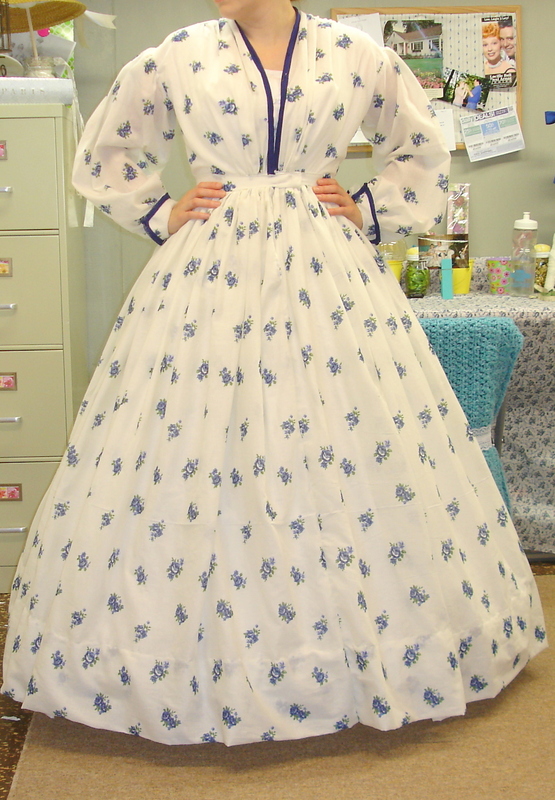 If you are going to be outside during the winter, I would make this petticoat out of quilted flannel for warmth. 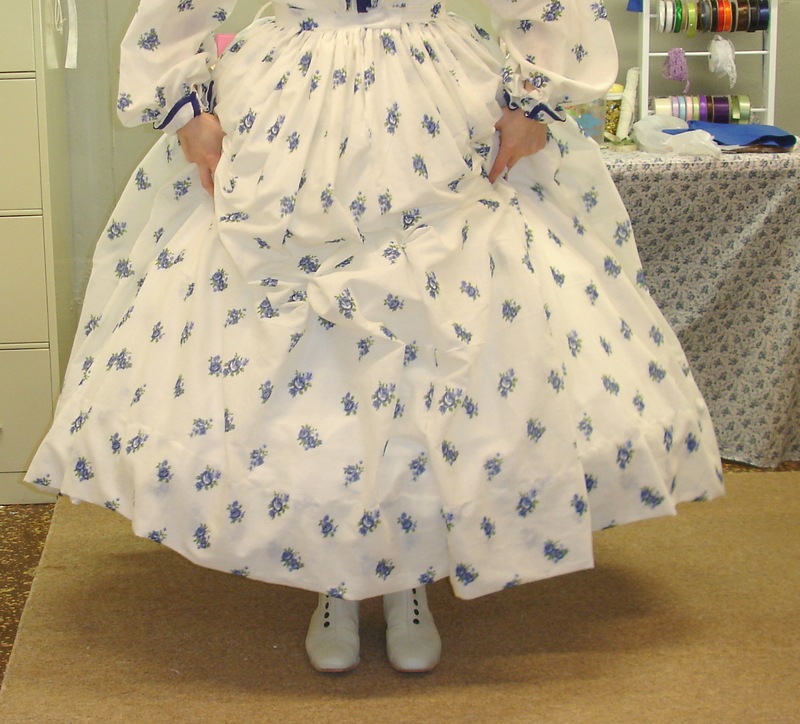 Put on your shoes and your hoopskirt…in that order…this way you can still reach your feet easily. Put on your over petticoat. Put on a corset cover if needed. 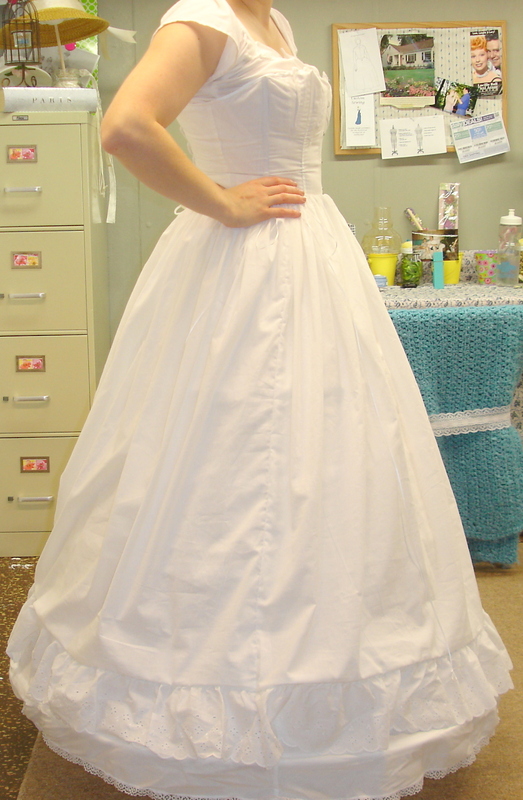 If your gown is of light or see through material, a corset cover is a must! Finally…put on your lovely dress of choice! P.S. 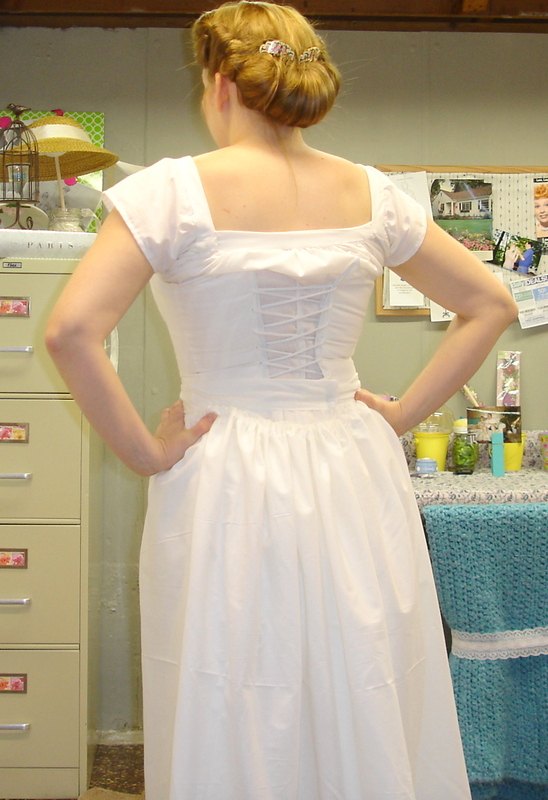 This dress is the completed (well, almost completed) blue and white Day Dress. All that is needed is the front hook and eye closures down the front. Put on jewelry, accessories, and hat! Now you are ready to go out after these ten easy (ok…well maybe not easy) steps. Oh and here is a close up of my new shoes!!! Love them! Hope this helps in your effort to put together the perfect Civil War outfit!! I love the shoes! Where did you get them? 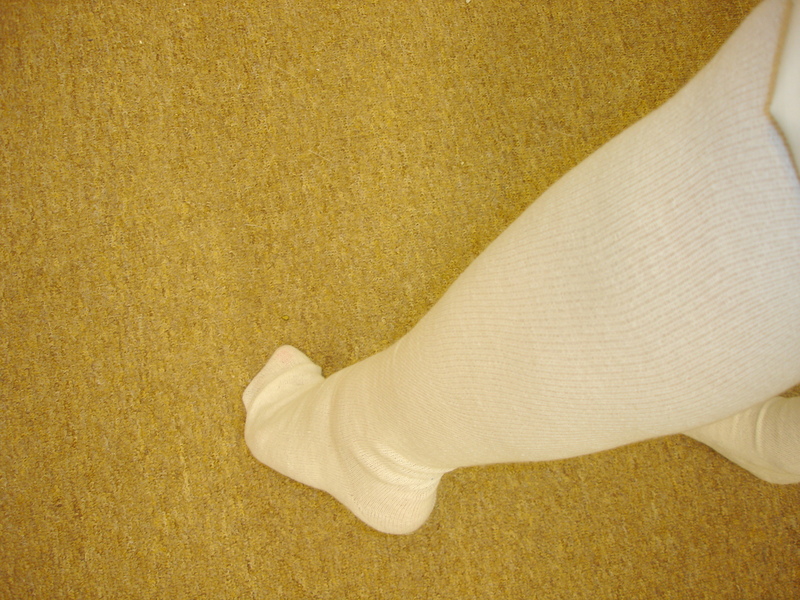 I am wanting to purchase a new pair of boots for the upcoming reenactments I will be attending.